Drawing was fundamental for Lloyd Rees; during the 1930s he made drawings to the exclusion of all else. His 1930s highly detailed and refined drawings of the environs of Sydney Harbour remain among the most popular works of his oeuvre. Rock faces and cliffs were a favoured subject of Rees. 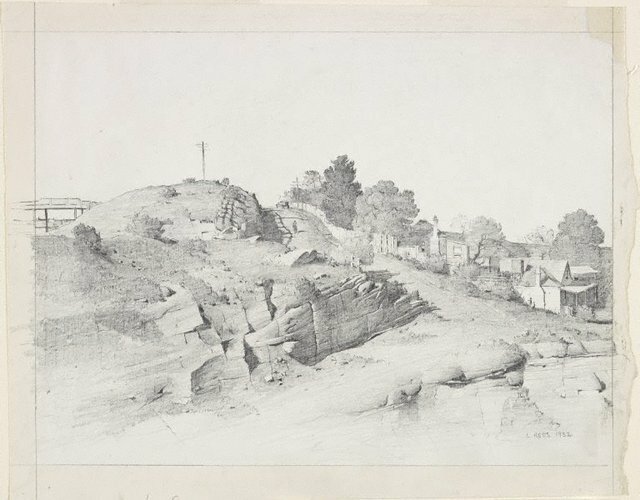 The subject of this drawing is Waverton, then Bay Road, near North Sydney, where Rees lived at various addresses between 1918-19, 1920-22 and 1931-34. Signed and dated l.r., pencil "L. REES 1932".